Dear Atiku, No Be By 'Black Panther' O! Former Vice President Abubakar Atiku, over the weekend, went to a cinema in Abuja to see the Marvel Cinematic Empire’s latest offering, Black Panther. According to Twitterverse, Atiku became the cinema himself. In the spirit of Baba rere, Baba ke! with which he was heralded, Atiku paid for people’s cinema tickets. Relatively, the one with the perspicacity to use the social media to advantage and position himself as the “youth’s youth,” the former Vice President tweeted his appreciation of the film and wrote his reflection on the lessons Black Panther held for Nigerians. Atiku is likely to run for the Presidency in 2019 and his activities that are being translated into social media showings are calibrated towards having a good outing in 2019. 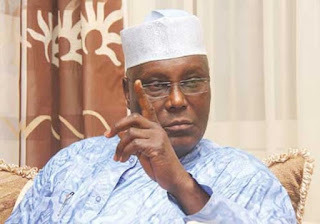 I have no problems with Atiku’s candidature although I believe that, by now, he should be Nigeria’s past tense and not jockeying for leadership roles anymore. Atiku, to be honest, came across as a prepared candidate in 2015. He had done his homework far much more than Muhammadu Buhari. But, what counted against Atiku and all those who stood against Buhari then was corruption. Buhari only needed to shout “corruption,” and his followers would take up the refrain without asking him what he meant by corruption and what innovative ways he had designed to counter it. Come 2019, Buhari can no longer use corruption as his unique selling point and get reasonable people to buy his wares. At the rate the “anything but Buhari” sentiment is percolating, the choice for the Presidency might fall on Atiku. That is one reason he should be taken seriously and interrogated with vigour. Otherwise, Nigerians will soon find themselves buying another overrated and overpriced presidential candidate; one who cannot even be honest or reflective enough to see when the ground beneath his feet is giving way. One of the most significant failings of Nigerians in 2015 was allowing Buhari to get away with not debating with his opponents. If we had stopped to ponder then, we should have asked what manner of officer runs away from battle? From 2015, the cowardice that made Buhari skip an essential ritual of democracy has been a defining trait of his Presidency. From avoiding talking to Nigerians, to the aloofness that has kept him away from those who have been slaughtered in their homes because his government has done poorly on security, Buhari has checked every box. For 2019, it is crucial we learn a lesson and not, once again, let the ostentatious parade of populism obscure what matters. Atiku’s buying film tickets, watching a popular movie, and writing his reflection on it are all part of the games that politicians play at election time. I understand that he has to connect to millennials but beyond all those, he should be talking about specific ideas that show that he has the potential for the creative governance Nigeria needs. Films are great places to look for inspiration, but no country needs leadership that takes its lessons from films. Africa needs leaders that have read widely, and who, like the sons of Issachar, have an understanding of the times and what a country needs to do to raise its head. They should have read the history of all cultures from Africa to ancient Greek, philosophy, and also have an understanding of how the modern world functions. A popular fare like Black Panther is highly unlikely to fill in those gaps. Atiku can watch all the film he likes, but, when he wants to address the issues that face Nigeria, he needs more than a popular culture reference. If at all he must talk about Wakanda, he should be having a brutal self-reflection on why he is one of the many reasons Nigeria is not – and cannot yet be- like Wakanda. If he reflects on the leadership he was part of between 1999 and 2007, he will come up with far more uneasy answers on why things are the way they are, and what needs to be done. He would understand why the vision of Africa he wants us to aspire to in Wakanda came from America, and not among Africans themselves. Black Panther was a comic started in the 1960s by a group of young men who were incidentally Jews. More than 50 years after they first dreamt of a sophisticated African future, no African country has come near to inhabiting that vision. We are poorer than ever, our population is outpacing resources, and we still look towards the west for everything — from food to technology, and even to a vision of the future. Our writers hardly write futuristic stories or science fictions; our stories instead are full of pessimism: poverty, corruption, disease and dehumanising spectres. To write stories like Black Panther, we will need to have given our children quality education that premises scientific thinking and its endless possibilities. Then, they would ask why our schools are so decrepit, and why our children are given an education so poor and outdated that dreams of the future are almost an unaffordable luxury. Recently, a Ghanaian teacher went viral on social media for drawing a computer on the blackboard for his students. In 2018, African children are being made to learn computer in a way it would not have been done even in the 80s. If African leaders gave up some of their vainglorious superfluities, they would be able to provide standard schools to children and hopefully even buy them computers. But no, never, they will not do that because they are too selfish and myopic. They will rather spend the money on frivolities, travel abroad, and try to impress western leaders who already think of them as “shithole” tropes. A future like Wakanda is worth aspiring to, but the path to that kind of future will take much more than drawing apparent lessons. It takes a lot of work; self-introspection, building a new political and social culture; and a leadership that has cultivated enough self-mastery to challenge our social culture, and rightfully too. Ours is a society where books are unavailable in schools but some of the most vibrant publishing presses are run by the church. They issue out books containing magical tales until impressionable minds are convinced that science is the white man’s indulgence, that some supernatural realities exist beyond the natural and we will never know. In that kind of social context, how can you have a society where vibranium is a thing let alone have the citizenry that understands what to do with it? Sorry, Atiku, you took away only the easy lessons from Black Panther.